Whether it’s candy floss, baby, lipstick or rose, when it comes to autumn flowering bulbs, shades of pink are decidedly de rigueur. Right now there are colchicums, schizostylis, crinums, cyclamen and nerines, all emerging blushing and bright when earlier flowers are starting to fade. Queen amongst these rubicund beauties is Amaryllis belladonna, a slightly tender bulb native to South Africa but widely naturalised in warm temperate regions of the world. 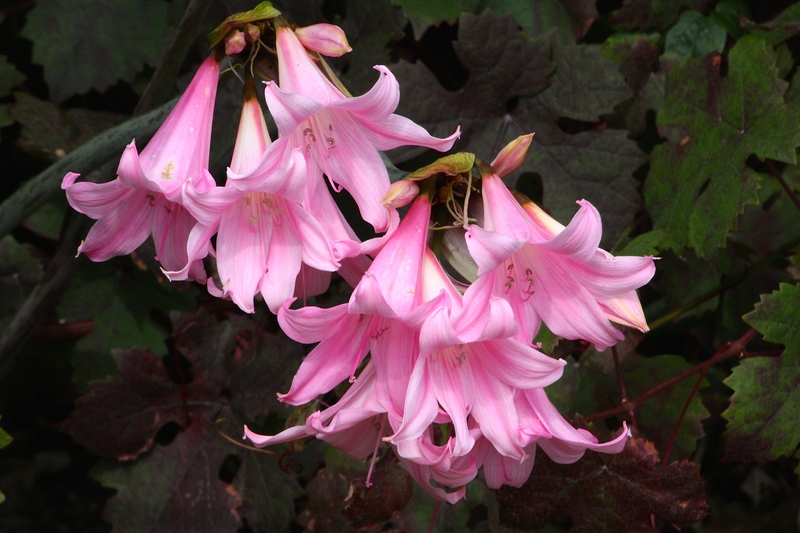 Like colchicums, Amaryllis belladonna produces flowers before coming into leaf, and shares the same unflattering common name ‘naked ladies’. The large bulbs enjoy the shelter of a south or west facing wall where they will remain dry in summer and find protection for their late developing leaves. If in doubt, they make lovely subjects for an unheated greenhouse. These particular blooms were captured emerging from the earth at the foot of the curved wall in Sissinghurst’s rose garden, flattered by a backdrop of vine leaves. Pure pink perfection. They are just simply stunning. Thank you for the photos. I love Amaryllis Belladonna. Such a sweet scent and looks good in a mixed vase to perfume the house! It is curious that all these bulbs have such delectable yet obtrusive leaves. I put my hippeastrums outside in the summer and the snails just gravitate towards them. In contrast they don’t seem a bit interested in agapanthus, which look similar but clearly are not in the same culinary league!